A couple of pages from the example book, butchered by me. 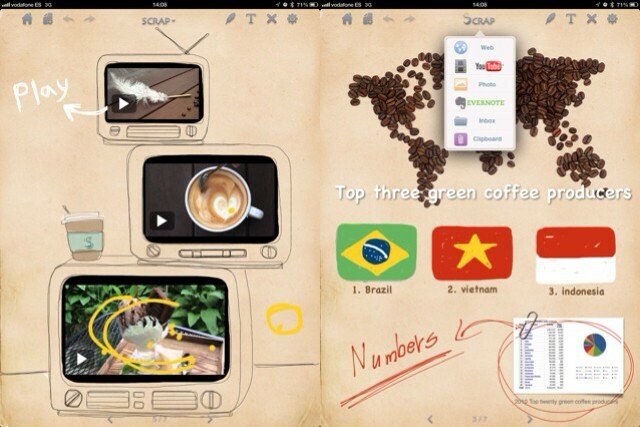 I have been looking for a decent scrapbook app for the iPad for quite some time. So I was pretty happy yesterday when I saw the brand-new Scrapnote, a snippet-organizing app which pulls in photos, videos, text, scribbles, handwriting and even Evernote notes, all into slick, handsome and easy-to-edit notebooks. If you have been looking for a research tool, or a way to put together travel journals, diaries or – really – anything involving words, pictures and snippets of information, you should probably go and download Scapnote right now. Scrapnote uses a notebook metaphor for its layout, and you can choose various paper styles on the inside, and cover designs on the outside. You can add content in several ways. First, you can draw and write on the page. The ink engine is as smooth as any (and I’m a fussy Penultimate and Noteshelf user), and there are three pen styles, plus various colors and ink thicknesses, plus an eraser. Or you can tap and start typing. Text is added in boxes which can later be moved around, and you can pick both colors and fonts, as well as resizing the text. Pictures come by way of your photo albums, and you can add multiple pictures in a (resizable) stack and slick through them as if you had left a stack of cards on the page. You can also scrawl on top of the pictures if you like. Pictures can also be clipped from the in-app web browser, either using a screen-grabbing crop tool, or by using the neat image browser which teams up with sites like Google Image Search to provide a grid of available pictures, ready to be added with a tap. Video come from YouTube, and can be resized and put where you like. In fact, you can long-tap on any element to edit it, resize it or move it around. It really is as freeform as a paper scrapbook. More so, really, as there’s no glue to unstick. And then there’s Evernote integration. Log in to your account and you can browse all your note from within Scrapnote itself, and then place them onto the page. This works for web clippings, text notes and even pictures. Anything else? Sure. There’s a bookmarklet so you can grab anything from Safari, and also full support for iOS’ “Open In” functionality. Clipped items are stored in Scrapnote’s inbox, ready to be accessed from the universal drop-down menu. It’ll take PDFs, Word documents, spreadsheets – almost anything. Scrapnote is incredibly slick, especially for a brand new app. And at $3, you’d be a fool not to buy it. Unless you hate great apps, I guess.